One New York City doorman takes his job really seriously — so seriously he punched out photographer Tim Wiencis outside an Upper East Side building for trying to get a shot of the wife of latest Ponzi scheme mastermind Ken Starr. The doorman was arrested for assault. 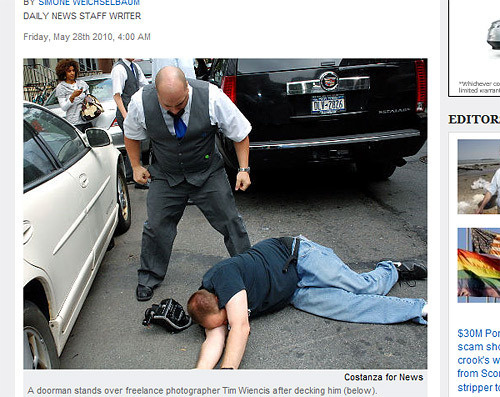 It should be noted that Wiencis was on a public sidewalk covering a news event as part of his job, and the doorman was certainly out of line — inexplicably resorting to violence to protect…what? A very possible criminal who lives in his building. It doesn’t seem worth it. I thought photographers didn’t have to many occupational hazards. Well, add one to the list. The photographer and his family are being stalked and harassed now by a sick stalker who wants to ruin their lives. Really? Do you have any more info? Send it to us (via email link above) and we can post on it. I used to work with Tim Wiencis in Massachusetts.